Local restaurants serve up their most popular salads. The Buddha Salad from Peoples Organic in Eden Prairie. The days are getting longer and the temperatures are rising. It’s time for lunch on the patio, dinners by the lake and menus rich with the season’s best variety. With fresh fruits and vegetables, salads take on creative twists with bold flavor combinations. Once thought of as only the start of a meal, salads have taken on a life of their own and are becoming more popular as an entrée item. Pick your favorites, or let the experts at restaurants throughout the southwest metro give you their recommendations for a delicious summer salad sure to delight. Known for its organic, local and fair trade ingredients, Peoples Organic is serving up Earthbound salads that offer a variety of creative twists. From the typical favorites of cobb or Caesar salads, the restaurant offers alternatives, such as the roasted beet salad, which is made of bibb lettuce, roasted beets, goat cheese, and tamari sunflower seeds with balsamic vinaigrette. Another popular choice is the Buddha salad, which includes steamed organic brown rice, organic kale, house-made guacamole, homemade hummus, radish, cucumber, roasted tomatoes, scallions, micro-greens, kalamata olives, toasted organic sunflower seeds and harissa with a lemon herb vinaigrette. “It has a lot of great stuff,” says general manager Nicole Mondt. “People really like the combination.” $13.50. If you’re in Waconia, stop by Who’s On First for the popular Cajun chicken salad, brought to the menu by Louisiana native and head chef Lionel Stewart. The entrée-style salad starts with a bed of mixed greens, topped with Cajun-battered chicken, eggs, carrot slivers, black olives, grated cheese and tomato wedges, dressed with hot bacon mustard dressing to add a final kick. “This is a true New Orleans recipe,” says Stewart, “It brings that spicy flavor of the south to Minnesota.” $10.49. Best known for its seasoned and slow- smoked meat, Dickey’s Barbecue Pit offers the customer favorite smokehouse salad. Sourcing only the highest quality meats in the country and slow smoked in hickory wood burning pits onsite daily, the house signature salad features chopped beef brisket, romaine lettuce, shredded cheddar, fried onion tanglers and ranch dressing. $7.50. Offering fresh garden salads, the menu at Victoria House in downtown Victoria features gluten-free options and a variety of flavor combinations sure to satisfy your appetite. A popular choice during the summer months is the raspberry salmon salad, says general manager Barbara Kuzelka. Featuring lightly seasoned, broiled salmon on a bed of fresh spinach with red onion, crumbled blue cheese and fresh fruit, served with raspberry vinaigrette, this salad is perfect for hot days and cool nights. Enjoy it with a glass of wine and you’re set. $14.99. Whether you’re looking for a great lunch or dinner, the Chanhassen Houlihan’s has entrée style salads to satisfy any appetite. For the perfect summertime salad that brings new meaning to the word “fresh,” try the char-crusted ahi tuna salad. This delicious option features seared ahi tuna sliced and served over a napa-cabbage blend, iceburg lettuce and spinach with cashews, fresh and dried banana chips, carrots, scallions and cilantro, all tossed in a banana-ginger vinaigrette and topped with crispy wonton strips along with drizzles of wasabi mayo and toasted sesame seeds. $15.95. The sunny lakeside deck overlooking Lake Waconia is the perfect place to be on a lazy summer afternoon. When you’re there, indulge in the ever popular spinach salad, spotlighting baby spinach, Erin gold smoked gouda, poached craisins, strawberries, candied almonds and a raspberry balsamic dressing. Assistant manager Lindsey Frisvold says the summery salad is very popular and that people typically add chicken or salmon to make it a meal. $13. Campiello Eden Prairie offers inventive Italian cuisine, inspired by traditional Tuscan country cooking, with an open kitchen and many wood-roasted and rotisserie-grilled specialties. When it comes to entrée salads, you’ll want to try the chicken and roasted pear salad, served with gorgonzola cheese and candied walnuts. General manager Josh Duffy calls this popular salad “absolutely delicious.” $15.95. 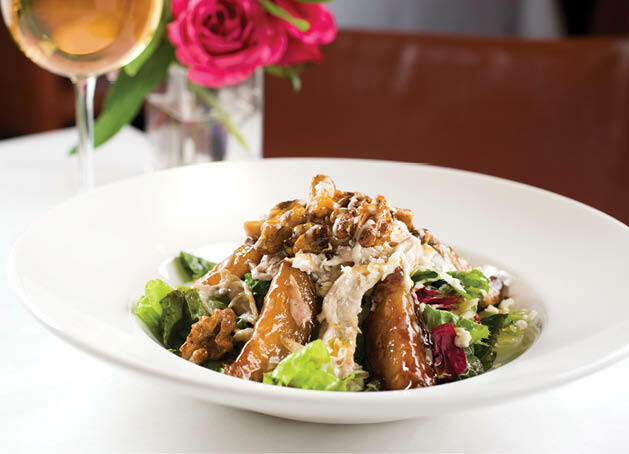 From the traditional house, wedge or Caesar salad to start a meal or to the entrée-style salads featuring the restaurant’s signature rotisserie chicken, Redstone offers a salad perfect for your appetite. Try the smokehouse steak Cobb salad with steak medallions, mixed greens, applewood smoked bacon, grilled asparagus, sweet corn, red onion, grape tomatoes, shredded gouda and smoked onion ranch dressing. From the Tuscan kale and spinach salad to the roasted beet and goat cheese salad to the grilled steak and blue cheese salad, it will be hard to pick just one of the signature salads at Wildfire in Eden Prairie. Whether you are sharing a salad before a meal or you’d prefer the entrée size, general manager Jason Burt recommends the Wildfire chopped salad made with roasted chicken, avocados, tomatoes, blue cheese, bacon, scallions, corn, tortilla strips and tossed with a citrus lime vinaigrette. Small, $13.95 and large, $23.95.